Girlfriends was a fun show when it came out. I remember when it began on UPN. You will recognize some of the stars because they're now hits on other series, such as Tracee Ellis Ross, who now stars in "black-ish" on ABC. My favorite was Golden Brooks, who played Maya. I think I stopped watching the show at some point, but I don't remember why...it still holds up now. I'm very happy to get all 8 seasons on DVD. There are plenty of Special Features, too, that any fan of the series will enjoy. I'm not saying it's the funniest show in the world, but I liked it because the characters were likable and I enjoyed seeing their lives and relationships. This is probably a "chick series," so get it for your favorite woman, and she'll appreciate it. Girlfriends is a glimpse into the lives of four friends as they navigate their way through life's trials and tribulations with wit and humor. Through all the challenges of work and relationships, their friendship remains their bond. Available for the first time in a new shelf-friendly complete series collection. 25-disc set includes all 8 seasons and all 172 episodes, plus special features. Created by Mara Brock Akil ("The Game," "Being Mary Jane"). Executive produced by Kelsey Grammer ("Cheers," "Frasier") Starring Golden Globe winner Tracee Ellis Ross ("Black-ish"). Guest appearances by Cindy Williams ("Laverne & Shirley"), Common (Suicide Squad), Katt Williams (the upcoming Bastards), Idris Elba (The Dark Tower), Malik Yoba ("Designated Survivor"), Wayne Brady ("Whose Line Is It Anyway? "), Wendell Pierce ("The Wire"), and more! 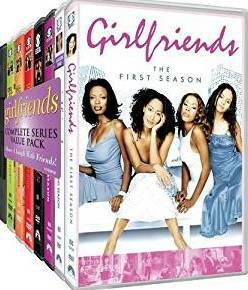 CBS Home Entertainment and Paramount Home Media Distribution have today announced that on January 9th for Girlfriends - The Complete Series on DVD. All 8 seasons on 25 discs.